Review: More from James "Burnski" Burnham under the Instinct alias, a pseudonym he seems to utilize for forthright, no-nonsense club tracks. 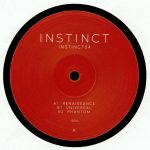 There's naturally plenty of playable material to be found on this fourth Instinct EP. First turn your attention to A-side "Renaissance", where slowly rising, progressive house style orchestration and dreamy deep house pads cluster around punchy two-step beats and starburst electronics. Turn to the flipside and you'll find the swinging but driving tech-house chunkiness of "Universal", as well as the sub-heavy trip that is two-step tech-house cut "Phantom". That cut boasts some particularly attractive soulful vocal samples that seem to drift across the sound space at key moments.